Students at the University of Plymouth are to benefit from a new science centre that will enable them to study animals at close quarters – thanks to a collaboration with Dartmoor Zoological Park (DZP). 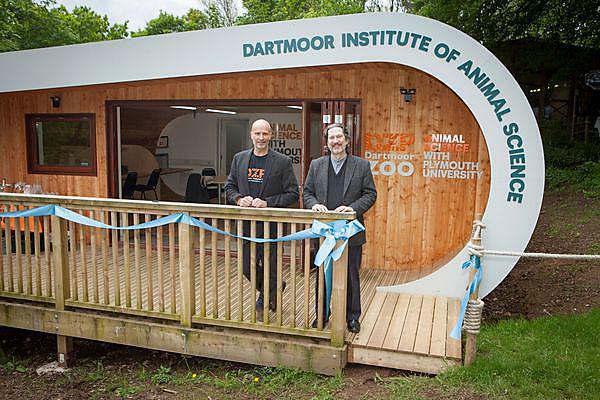 The DIAS (Dartmoor Institute of Animal Science) Pod will be used by students on a range of degrees, including those specialising in animal behaviour and welfare, psychology, biological sciences and conservation biology. It will also be used by arts students for life drawing, and postgraduate students studying zoo conservation. The facility, located next to the zoo’s education centre, was formally opened this week by DZP CEO, Benjamin Mee, and Professor Kevin Jones, Dean of the Faculty of Science and Engineering. The pod will be able to house up to 30 students and has been built to an eco-friendly design using wood – with no right angles, a feature that is believed to have a beneficial effect upon wellbeing. “The DIAS Pod enables us to host students on site and provides them with a comfortable base of operations that will support a range of degree programmes and activities. It’s an ideal space for them to be able to observe the animals and contribute to our joint research interests. The DIAS Pod will be used by students on placements, and those undertaking dissertation projects, with 27 set to be based there from September. It has also been designed to host lectures, and as research topics arise, so specialist equipment and computers will be added.